I will take part in the swap-meet tomorrow, starting at 3:00 PM, taking place at my favorite bar, Dirty Frank’s, on 13th and Pine streets in Philadelphia. There I will sell my books of poetry and my anthology. I will also be at Fergie’s Pub, 1214 Sansom Street in Philadelphia, for the Wednesday evening poetry reading of the Moonstone Arts Center, http://moonstoneartscenter.org/ . On Wednesday, November 21, the featured readers will be Hanoch Guy and Lisa Grunberger, with warren Longmire as host; on Wednesday, November 28, the featured readers will be Lynn Levin and Joan Roberta Ryan, with Alina MacNeal and Jennifer Hook as hosts. Following the featured readers will be the open mic, where I and other fine Philadelphia poets will read their material. On Saturday, November 10, I attended Sounds and Words, a fundraiser for the Moonstone Arts Center, held at District Council 1199C, 1315 Locust Street in Philadelphia. Moonstone has been the platform for poets (like me) to publish and perform their works. Larry Robin, left, and founder of Moonstone, alongside of Elliot Levin, poets and saxophonist. The volumes of poetry published by Moonstone on display. Tomorrow, November 10, I will attend a Resource Brunch, featuring Philadelphia city agencies and social service agencies, at Galdo’s Catering, on 20th Street and Moyamensing Avenue in Philadelphia; this event is sponsored by City Council-member Kenyatta Johnson. Later that evening, I will attend the event, Sounds and Words, a fundraiser for the Moonstone Arts Center, one of the greatest promoters of new poetic talent in Philadelphia. It will take place at District Council 1199C, 1319 Locust Street in Philadelphia. There we will be entertained by the music of Bobby Zankel’s Wonderful Sound 4, with Sumi Tonooka, Richard Hall, and Elliot Levin; and poetry by Sonia Sanchez, Joe Roarty, Jamar Hall, Ryan Eches, Michelle Myers, Jeffery Ethan Lee, Bethlehem Robertson, Kirwyn Sutherland, Kimmika Williams Witherspoon, and Cityekai Afua Zankel. On Sunday, August 26, I will take part in Swap Meet Sunday at Dirty Frank’s, 13th and Pine streets, from 2:00 PM to 6:00 PM, having my books available for sale, joining other local sellers and crafts people with their products. There will also be an art opening and a Latin band. I hope to see you there also. I will be joining members of the Philadelphia chapter of the Jewish Labor Committee (JLC) in a rally at Penn’s Landing in Philadelphia, tomorrow, August 15, 2018, at 4:00 PM, to protest the detaining of immigrants and the separation of children from their parents. The policies pursued by this regime is nothing short of conscious cruelty, and racism is the only reason behind it-the idea that certain groups of people are less worthy of respect. To stand against this is the only right way to go. Following that, I will join with other fine Philadelphia poets at the poetry reading, sponsored by the Moonstone Arts Center (http://moonstoneartscenter.org/) for their weekly poetry reading at Fergie’s Pub (http://www.fergies.com/), 1214 Sansom Street in Philadelphia. I will take part in the open reading following the featured readers’ performances. I continue to support Moonstone and their work in promoting poetry among working people; the arts are not a luxury, they are a necessity for all of us. I will attend the reading of the Moonstone Arts Center, to be held at Fergie’s Pub, 1214 Sansom Street in Philadelphia, on Wednesday, July 25, 2018. (http://www.fergies.com/) The featured readers will be Clinton Smith, poet, prose writer, and musician; and poet Elijah Pryor. There will be an open mic reading, which I shall take part in. (http://www.moonstoneartscenter.org/). This Sunday afternoon, July 22, 2018, I will have my books for sale at the swap-meet taking place at my favorite bar, Dirty Frank’s, 13th and Pine streets in Philadelphia. The anthology, All OF The Above, will be $20.00 per copy, and the two poetry volumes, Mutterings and Out Of The Box, will go for $10.00 each. I hope to see you there. 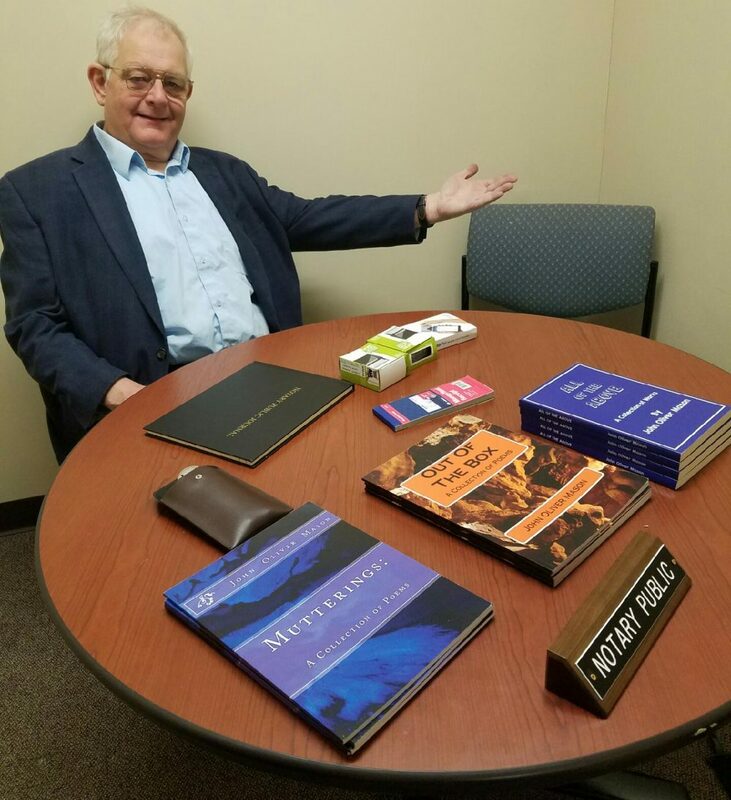 I will hold office hours for my Notary work, and to sell my books, at 1500 Walnut Street, suite 700, from 12:00-3:00 PM, on Thursday, June 28, 2018. I look forward to seeing you and working with you.